The engine cooling system is filled at the factory with a pre-diluted mixture of 50% Genuine NISSAN Long Life Antifreeze/Coolant (blue) and 50% water to provide year-round anti-freeze and coolant protection. The antifreeze solution contains rust and corrosion inhibitors. Additional engine cooling system additives are not necessary. Wait until the engine and radiator cool down. Serious burns could be caused by high pressure fluid escaping from the radiator. Refer to precautions in “If your vehicle overheats” found in the “In case of emergency” section of this manual. The engine coolant reservoir is a pressurized tank. When installing the cap, tighten it until a clicking sound is heard. 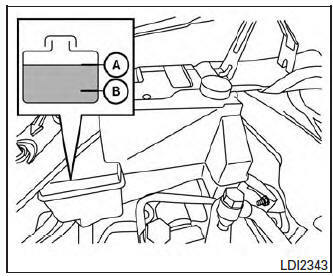 Never remove the radiator or engine coolant reservoir cap when the engine is hot. Serious burns could be caused by high pressure fluid escaping from the radiator.